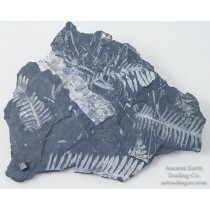 St. Clair, Pennyslvania Fern Plant Fossils for Sale - Leaves & Seeds - Ancient Earth Trading Co.
Llewellyn Formation 300 Ma - Pennsylvanian Period The plants died and fell into a swampy environment, where in the low temperature, pressure, and oxygen rich climate, the plant tissue was slowly replaced by pyrite (from sulphides). 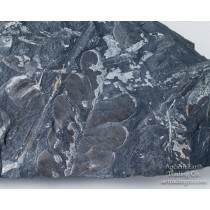 Pyrophyllite (aluminum silicate, a white colored mineral) is believed to have replaced the pyrite at a later stage as the sediments piled up and the temperature and pressure became greater. 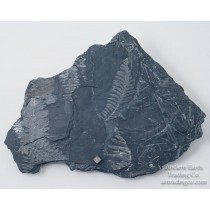 The ferns most commonly found are Alethopteris, Neuropteris, Pecopteris, and Sphenophyllum.